Most lasagna recipes are for a pan serving 8 to 10 people. 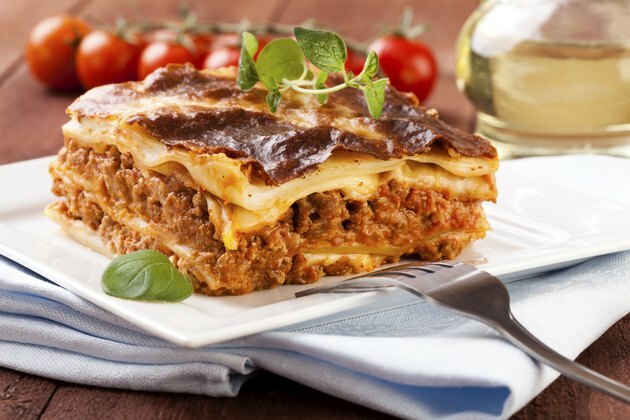 Lasagna is a bit tricky because of the many layers to warm and the outer cheese might get burnt or coagulate if you aren't careful. For those with small families, making a complete dish of lasagna is cost effective and time efficient, as long as you can reheat the dish without sacrificing flavor. Transfer the leftover lasagna to an oven-safe dish, if you've stored it in something else prior. Pull a sheet of tin foil long enough to cover the entire top of the dish. Tear the sheet from the roll once you know how much is needed. Cover the lasagna dish completely, creating as tight of a seal along the edge as possible. The greater the seal, the less chance of drying the pasta out. Stick a fork in the center of the lasagna, holding it there for 15 seconds. Pull the fork out and touch it. If the fork is warm, the lasagna is properly warmed. If not, put the lasagna back in the oven, checking it every 5 minutes. If you're concerned about the top layer drying out, save some of the lasagna sauce used in the original recipe. When reheating, add a thin layer of the sauce over the top of the cold lasagna. The sauce was already cooked and just needs to warm with rest of the dish. Eat leftovers within three days of making lasagna or freeze the remainder.